Full discretion: I am not a fangirl. I am a fan of certain things, but I don’t stalk bands or tattoo things on my body proclaiming my unending devotion to things I enjoy. True, I’ve lined up at 5:30 am for a U2 concert where the doors didn’t open until 7:30 that evening and I’ve traveled across the country numerous times to see Bono, Edge, Larry and Adam, but I don’t stalk them. I don’t hang out in front of the hotel they’re rumoured to be staying at, and I don’t wait near the buses hoping bands will come sign autographs after a show. I’d rather die than be pulled on stage with Bono, as he’s apt to do. I’m just not that girl. But I only had a few hours between arriving in Calgary and the show starting, not really enough time to do anything, so I went to the venue early and was right near the front of the line, thus securing myself a front row spot (on what is commonly known to U2’s fans as “Adam’s side”… in normal parlance, it would be stage… right, I guess (I never know whether it’s my right or theirs)). Anyway, PHENOMENAL show. Calexico opened and were so, so much fun and you could tell they were just having a blast up there. 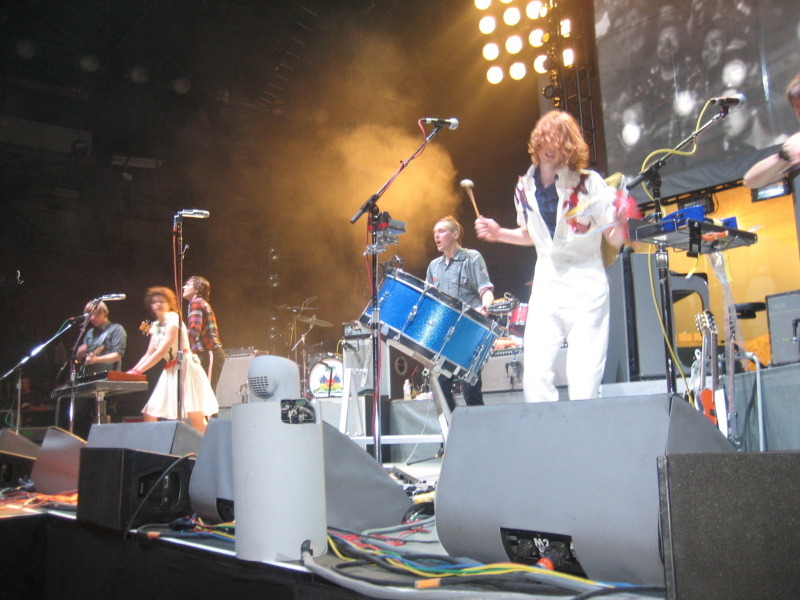 And then came Arcade Fire. I’ve seen them once before, 5 years ago at a crappy venue here in Edmonton, where my sightline was obliterated by a pole (but they later jammed in the lobby mere feet from us), but this is the first time I saw an entire show with them from front row (my second front row experience overall). Anyway, if you haven’t seen them live and you like them even a little bit, and the opportunity comes up? Do yourself a favour and go. There are eight people on stage and they don’t rely on bells and whistles. They are using 2 screens on this tour, which is pretty minimal by most acts’ standards. Instead, it’s about them. And yeah, it’s true that Win is the front man and you can’t help but give most of your attention to him (a review I read suggested that it’s because he’s 11 feet tall — not quite, but he’s definitely a tall man), but everyone else gets their moment. Régine, of course, sings lead on a couple of songs, but the rest of the time, she’s all over the place, and I couldn’t help but think of a whirling dervish when she was twirling around the stage. She’s so charismatic. But the highlight? I touched Win. He spent the bulk of his time at center stage, but during “We Used to Wait”, he came across in front of the speakers and I don’t know, it was like something took control of me and I couldn’t help myself, lol (don’t worry, it was just his arm. And his shirt). He has very soft skin (and oddly cool, considering it was like 900 degrees in there by that point). Later, when they came out for the encore, Régine tried grabbing people’s hands, but unlike her husband, she’s relatively short, and so am I, so I missed her. Sarah Neufeld, likewise, isn’t particularly tall, and she apologized when she couldn’t reach me, lol. “Sorry, I’m short.” Me too, sister. She was so cool, though. Two of the guys from Calexico came back out during “Ocean of Noise” to play horns and even though there were 8 other people on stage, they took full advantage of their moment. Amazing! All in all, this was such a great show, and I’m left wondering, not for the first time, how it is that Arcade Fire is not playing bigger venues yet. Their sound is so huge that it can easily fill an arena, if not larger. And judging by how fast the show sold out, the demand is there, too. I haven’t seen a ton of live music this year, but this was by far the best show I’ve been to in a while. By far. Simply amazing, and it was everything I needed. Next Post But Who Are My Real Friends? Have They All Got the Bends?